I’ve always been a bit of an over-achiever. This month’s theme of 2 in 1 meals, turned out to be 4 in 1 meals. 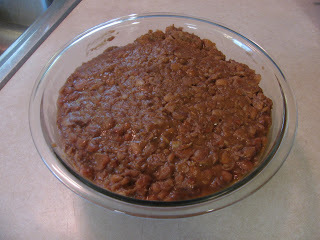 For as long as we have done this blog, I’ve looked for a good excuse to post my family favorite recipe: All Day Beans. They’re actually Mexican-style pinto beans but my husband started calling them “All Day Beans” because, well, they take all day. It is a very long and loving process in which I cook them, stir them, coach them, spice them, sweet talk them, and mash them to perfection. And in the end we have a huge bowl of beans that we can use all week. And we really do use them all week. 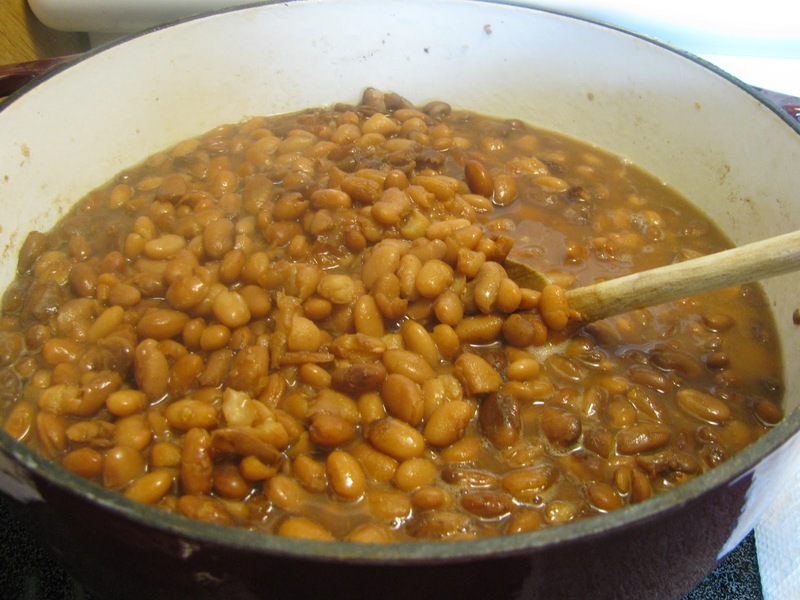 My mother always made these beans when I was growing up and the smell of them cooking still reminds me of home. We call them Buggy's Beans, because, well, we call her Buggy. Which is a story for another time. My brother also has his own version...but I'm not sure what he calls them. I'll get back to you on that. All three of us make them a little bit differently. Anyway, this is a dream recipe for any busy family. All it takes is one weekend day when the chef is home to create meals for the rest of the week. 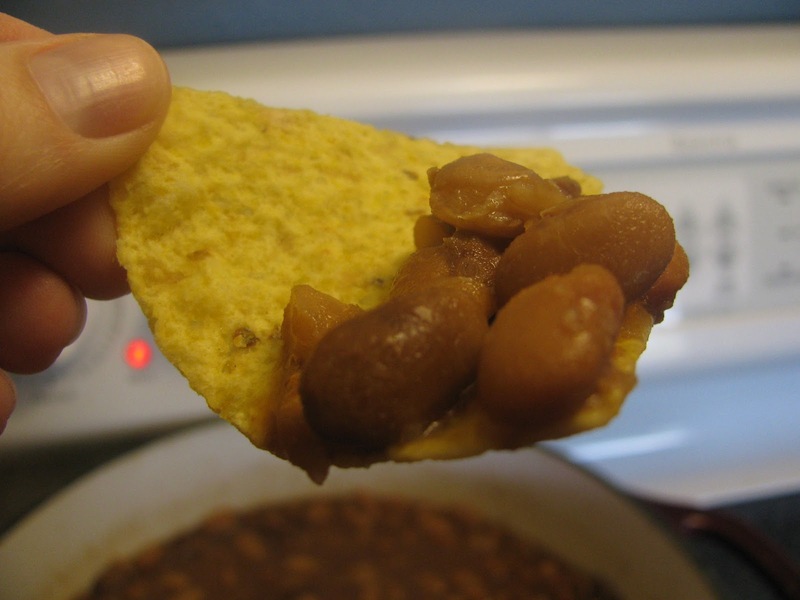 What follows is the recipe on how to make the beans and four examples of what you can do with them. To Soak or not to Soak? Disregard any and all instructions on the bean packaging. They will tell you to soak your beans overnight. But if you do that, the beans will soak up the flavor of water and not the flavor of the broth you’re about to cook them in and then they don’t taste nearly as good. Also, if you soak them ahead of time it takes less time to cook them. But you have all day, right? There’s also information out there that will tell you that soaking the beans will make you less gassy. Our family has not found that to be true. Beans are the musical fruit. Regardless of whether or not you soak them. Cooking the beans will take at least 6 hours. 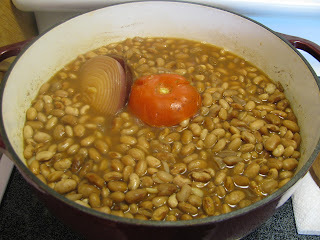 So, by 10:00 a.m., Rinse your dried beans and put them in a large pot on the stove. I love using a Dutch Oven to cook these. Add 10 cups of water. 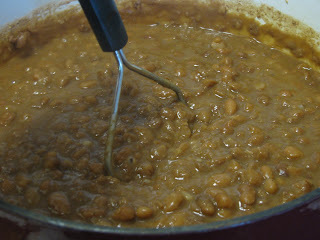 (As the beans cook they will soak this water up like a sponge so you may have to add more eventually). 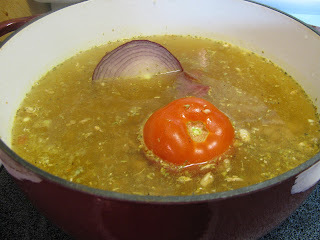 Add half onion, whole tomato, chicken bouillon, dried oregano, dashes of Tapatio, freshly ground pepper, diced garlic, and a bit of lime juice. Bring to a boil, then turn down the heat to medium low, cover and simmer for a couple of hours. After a couple of hours, check your beans and make sure they have enough water. If most of the water is already soaked up by the beans, add about 2 more cups, stir, then cover up again. Check again in about an hour. In fact, you can check these babies as often as you want. It’s better to add water as you go than to start out with too much water and have watery beans in the end. You want just enough water to barely cover the top of the beans. As the onion gets really soft you can remove it. The tomato will disintegrate eventually. Cook beans for another 4 or so hours. Once the beans are really tender and soft they are done. You can keep them whole or mash them so they act like refried beans. I like to mash. Taste them to see if they need salt. If so, add a bit at a time. Over-salting the beans can be bad (I’ve done this) so it’s important to start with just a little. 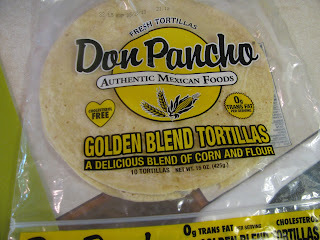 Especially because you’ll want to dip tortilla chips in them and those have salt on them too. Don’t ever salt the beans until after you cook them or they will get tough. It looks like I'm about to feed you here. I'm sorry about that. It was a really yummy bite. So, the beans are done! Yeah! Now, what can you do with them? 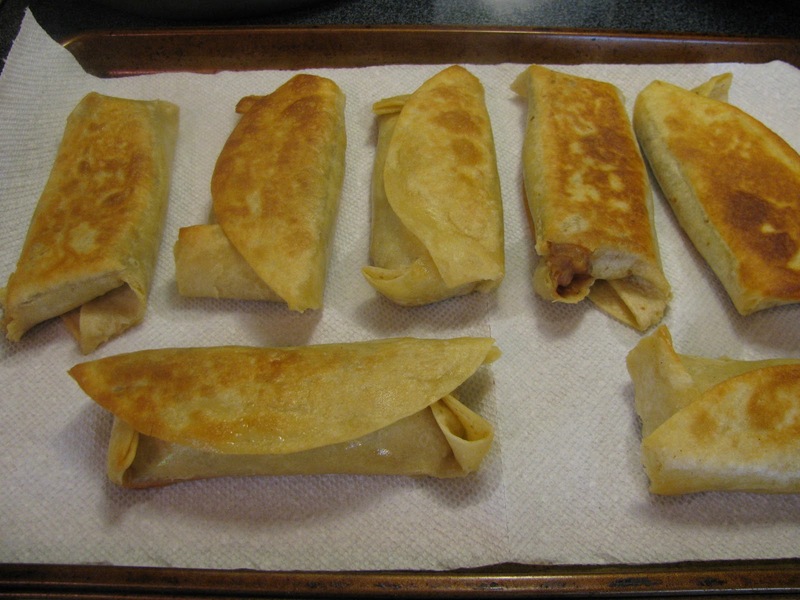 For the first night I made Chimichangas. 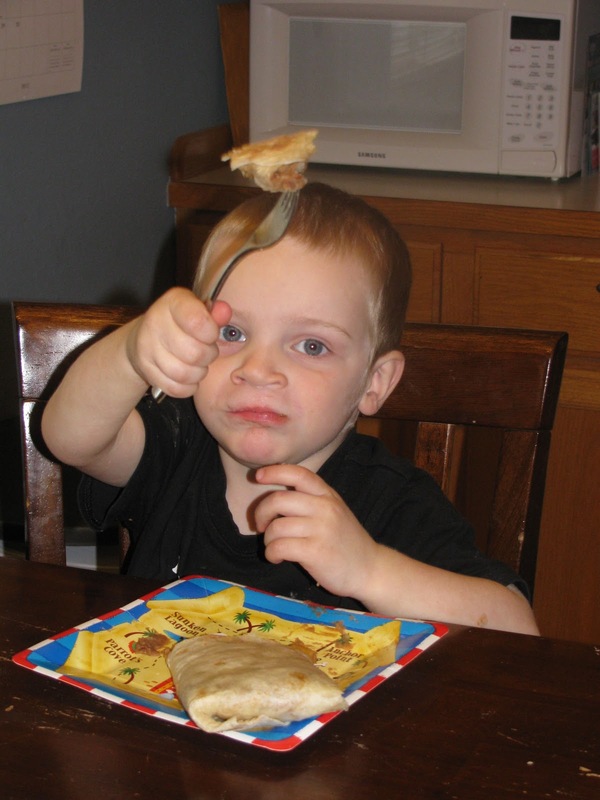 Which is basically like a fried burrito. 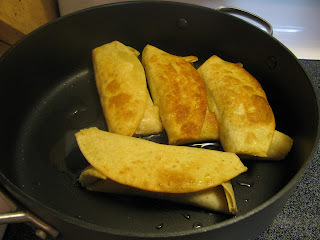 I filled tortillas with beans, cheese and chicken, wrapped them tightly, then fried them in a little bit of oil in a pan. Once they were golden brown on each side, I put them on a baking sheet covered with a paper towel and placed them in the oven on warm, which helps them dry out a bit and stay warm while I cook the rest. 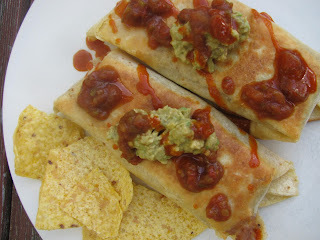 Top with guacamole, salsa and dashes of Tapatio. YUM! These are my favorite new tortillas. They taste like corn but are malleable like flour. Don't over-fill. You want your ingredients to stay inside. Just a little bit of oil in the bottom of the pan will make you swear that you are eating a deep-fried burrito, except you can't figure out why you don't feel bad about yourself. Pop in the oven on a paper towel and keep on warm until ready to serve. 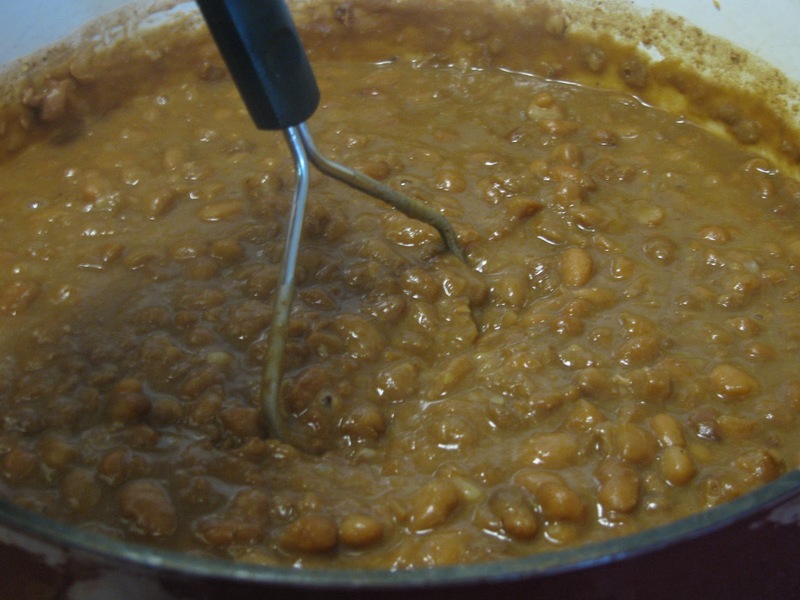 After you make your first meal, put the beans in a big bowl and let them cool for a half hour. 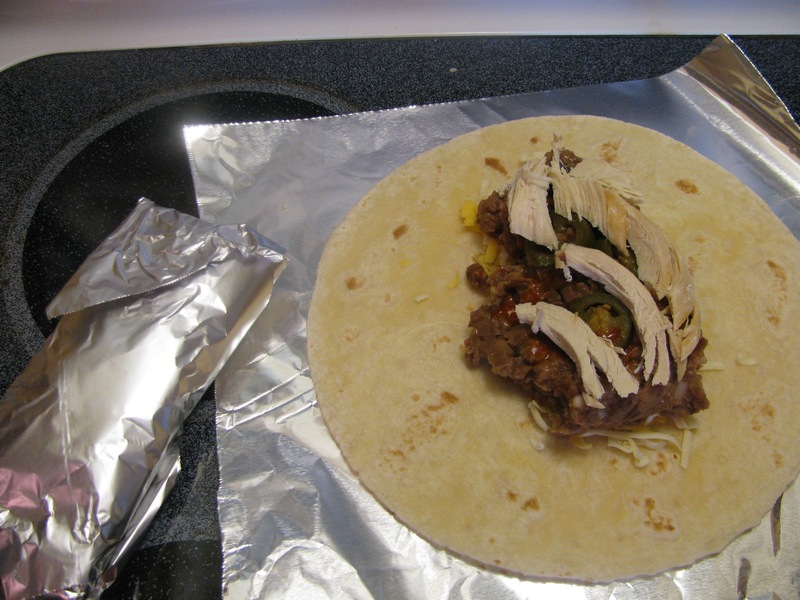 Then cover with plastic wrap and place in the refrigerator. 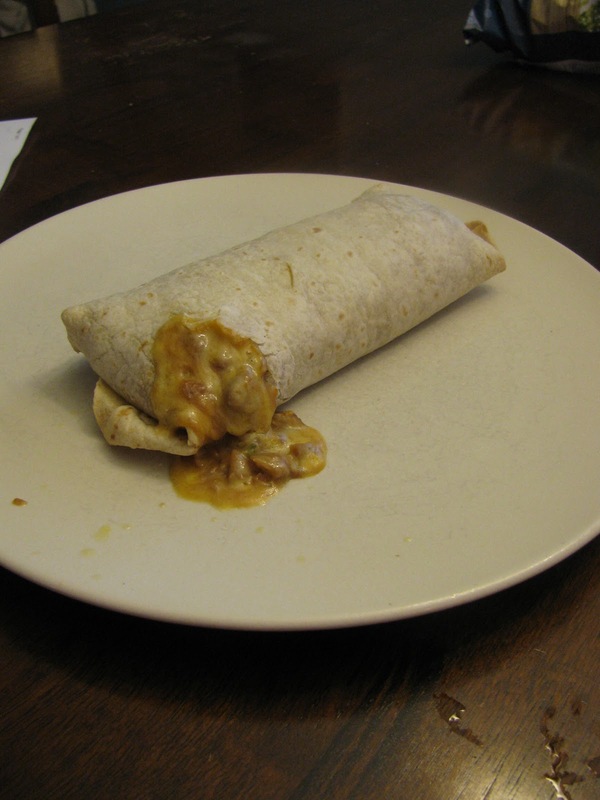 Night two: Baked Burritos. Picture us coming home on a Monday evening, house is a mess from the morning hectic rush to get out of the house, kids are throwing their muddy, wet coats on the clean floor, and I cannot wait to get out of these shoes. This one is so easy. Pre-heat oven to 350 degrees, fill tortilla with whatever you want on the inside (leftover chicken, cold beans, cold cheese, jalapeno slices) and wrap into a burrito. Then wrap that in tinfoil, stab a hole for ventilation in the top, and pop in the oven for 45 minutes. If you’re in a rush, use the microwave. Without the tinfoil, obviously. 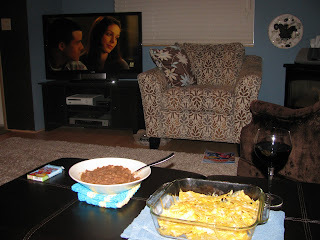 On the third night Andy was out of town, so I fed the kids bagels for dinner, put them to bed and did what I just LOVE to do when I’m alone: Watch episodes of Glee while eating nachos and drinking wine. I heated a bowl of beans for dipping. It just so happened to be the episode on guilty pleasures. Perfect! Night four: I’m sick of beans. Let’s take a break. Night five: one of my absolute favorites! Mexican Lasagna! 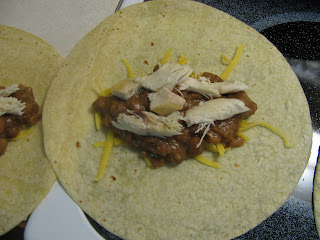 Take a pie dish, spray with non-stick spray and then layer: One tortilla, top that with a thick layer of beans and cheese, then add another tortilla, top that with chicken, salsa and cheese, then another tortilla, and top that with salsa and cheese. Cover with tinfoil and bake on 350 for about 30 minutes. 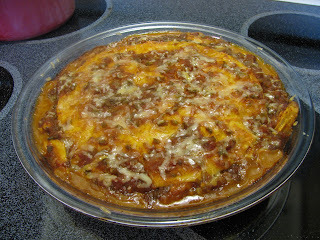 Then remove the tinfoil and bake an additional 15 or until everything is bubbly and saucy. 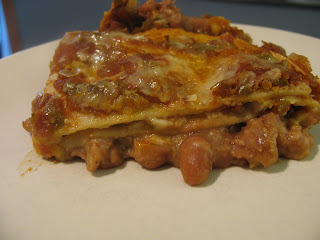 You can put anything in a Mexican lasagna and layer however you want. Just make sure you use either salsa or enchilada sauce or it will come out too dry. And that is it, my friends. You truly are only limited by your creativity. And though it may seem intimidating at first, I urge you to try this. With time you'll perfect your very own recipe. I want to bite that chip really bad and I reeeeally want that Mexican lasagna! I need to make this. 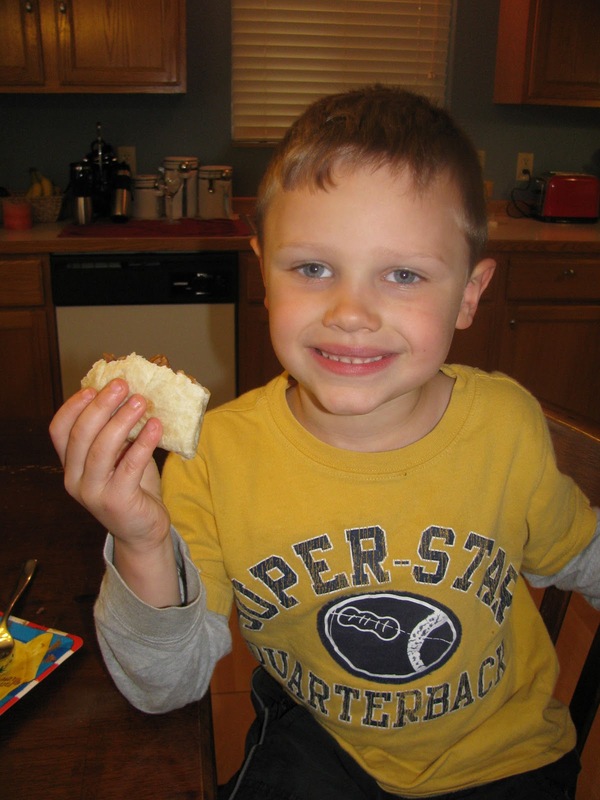 Btw, I love that Asher looks like he just killed his prey. Awesome post! Great post and great ideas! 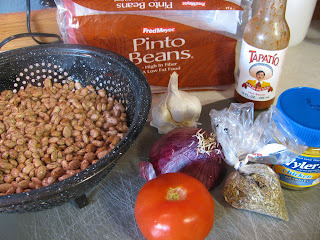 I make pinto beans fairly regularly but love the ways you put them to use!